The Internationally acclaimed APR Celica GT300 Widebody Kit is one of the cleanest body kits designed for the 2000-up Celica. 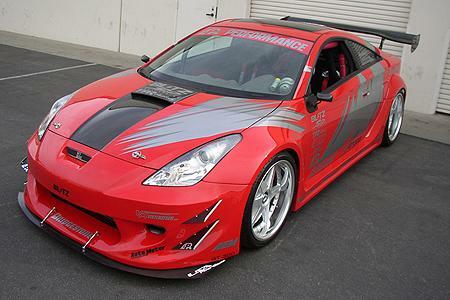 Not only does this aerodynamic kit have the perfect balance of smooth body lines that match the Celica’s unique shape but also this kit is designed to be a fully functional racing aerodynamic body kit. The wider stance helps the Celica run with wider wheels and tires. The front canards and splitter increase traction in the front for more power to the ground from the Celica’s front engine layout. The GTC-300 Celica OEM Spec Carbon Fiber Wing* provides a lightweight and adjustable aerodynamic component that increases rear wheel traction. It’s no wonder that the APR GT300 Celica has received the adoring raves from Celica enthusiasts across the world.